Gabis, Stanley T. 1978. Political Secrecy and Cultural Conflict. Administration & Society, Vol. 10, Issue. 2, p. 139. 1 It is my understanding that in the original study the four volumes dealing with negotiations are entitled: History of Contacts: Negotiations, 1965–1966 (VI C.I. ); Histories of Contacts: Marigold (VI C.2. ); Histories of Contacts: Sunflower (VI C.3. ); Negotiations, 1967–1968: History of Contacts (VI CA. ); and that the other volumes still officially regarded as classified are: The Overthrow of Ngo Dinh Diem, May-November 1963; Marine Units Go to DaNang; Phase I in the Build-up of U.S. Forces: The Debate, March-July, 1965; and two volumes on U.S./GVN Relations: 1963–1967. 2 Available for $17 from James S. Nash, DSD Records Administrator, Office of the Assistant Secretary of Defense (Administration), Room 2C263, The Pentagon. 3 This is from Gelb's Memorandum of Transmittal to McNamara, January 15, 1969. 4 He observes: “As I reread now my analyses written before mid-1969–and the writings of other strategic analysts, … I am struck by their tacit, unquestioned belief that we had a right to ‘win’ in ways defined by us. … That belief ended for me in August and September, 1969. …” Ellsberg, Daniel, Papers on the War (New York: Simon and Shuster, 1972), p. 28. 5 Memorandum for the President, from the Secretary of Defense, Washington, 16 March 1964, Gravel Edition, III, 503. 6 Among others, both Anthony Eden and Bao Dai's representative at Geneva, Tran Van Do, have stressed this (corroborated in talks I have had with them). 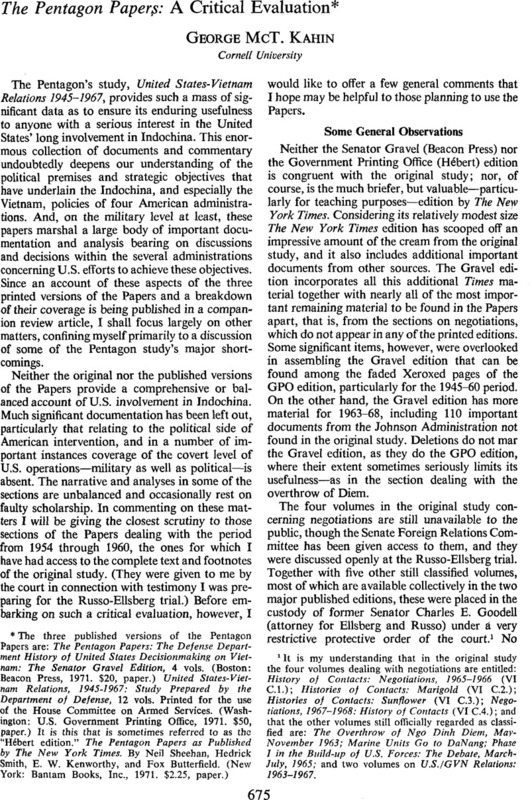 Those interested in the seriousness of the Hanoi government's concern with this matter and in Hanoi's repeated efforts to open up discussions with Saigon for working out election modalities are referred to the most substantial treatment of this subject, Weinstein's, Franklin B.Vietnam's Vnheld Elections (Ithaca: Cornell University Southeast Asia Program, 1966). 7 Especially useful is Pinto's, article, “La France et les Etats d'Indochine devant les Accords de Genève,” Revue Française de Science Politique, V (January-March, 1955), 63–91. 8 That treaty was signed well before most attributes of sovereignty had yet been transferred by France, and it was not until almost seven months after it was signed, and five months after the Geneva Conference, that all these attributes were actually transferred. 10 The other studies that Gelb assigns to this superior category are: U.S. Involvement in the Franco-Viet Minh War; The Overthrow of Ngo Dinh Diem; The Geneva Accords; Military Pressures Against North Vietnam, February 1964-January 1965; Marine Combat Units Go to DaNang, March 1965; Phase I in the Buildup of U.S. Forces, March-July 1965; U.S. Ground Strategy and Force Deployments, 1965–1968; Air War in the North, 1965–1968; Reemphasis on Pacification, 1965–1967; and U.S.-GVN Relations, 1963–1967. 12 He cites a CIA Current Intelligence Weekly Review dated 16 April 1958 as authority for his statement that Hanoi decided in December 1958 to open up a new stage of the struggle in the South. 13 Noting that Carver's article, “The Faceless Viet-cong,” (Foreign Affairs, 44, 04 1966, pp. 347–372) was a “compilation of evidences for the Administration's contention that the National Liberation Front of South Vietnam is a ‘contrived political mechanism’ of the Communist party of North Vietnam,” The New York Times (04 30, 1966, p. 10) reported that Senator J. W. Fulbright had asked the CIA to take a look at the propriety of letting its analysts present official statements and conclusions to American readers in the guise of independent scholarship. 14 For additional coverage, also available to U.S. government officials, see Vietnam Presse Bulletin d'In- formations Confidentielles for this period. This was a special radio monitoring for top officials of the Diem regime, and a set is held by Cornell University Library. 15 Well over half of the footnote citations in that central part of Gorman's study entitled Hanoi and the Insurgency in South Vietnam are from open sources, and this proportion holds in the treatment of some of the most controversial matters discussed. Thus, where he deals with the question of agrarian reform in the North all but eight of this thirty footnotes (numbers 20 to 49 in Vol. II, GPO edition, pp. 9–16 of IV, A 5, Tab 3) refer to open published sources. Of these eight, four cite open sources first, but apparently for corroboration add some that are classified; and the four that cite exclusively classified sources relate to matters of peripheral importance where the data are also available in open published materials. Hoang Van Chi is cited six times in this section, without any indi- cation of his strong bias. Initially he worked in Saigon for the U.S. Information Agency and Diem's Ministry of Information, which helped subsidize publication of his first book, The New Class in North Vietnam, precursor to his later publication, From Colonialism to Communism, upon which Gorman depended heavily. Publication of this second book was subsidized by the U.S. Information Agency, and called to the attention of Foreign Affairs readers by the CIA's George Carver as a study that “merits the careful attention of anyone interested in Vietnamese affairs.” In recent years Chi is reported to have been working in Washington for USIA and AID and as a consultant to the Rand Corporation. For a comprehensive critique of Hoang Van Chi's writings, see Porter, D. Gareth, The Myth of the Bloodbath, International Relations of East Asia Project, Monograph No. 2 (Ithaca: Cornell University, 1972), esp. pp. 44–46. 16 The first 276 pages of Vol. IV of the Gravel edition and the first 384 pages of Vol. VI of the GPO edition are devoted to the air war in the North. 17 Witnessed by the writer. As early as mid-September 1972, within the city, whole blocks of workers' housing, several schools, and a wing of a hospital had been destroyed. 18 This, I believe, is now beginning to be rather widely acknowledged, and I can provide eyewitness corroboration on the basis of a trip I took north of Hanoi and through part of the Viet Bac (the extensive upland and mountainous area fronting on the China border) in late September 1972. The volume of truck traffic coming down over the roads out of China was enormous, many times heavier than I had witnessed on any road in the North during a visit the previous year. Few of the trucks were laden with oil or gasoline, for a pipeline had been laid to the China frontier; and at night at least as far north as Thai Nguyen, the railroad still operated. Thus, despite the heavy daily bombing attacks that the U.S. mounted in 1972, the augmented flow of overland traffic from the China border compensated for most of the imports that had previously been shipped in via Haiphong and other harbors. Helping insure this was a tremendous extension of the road system through a crash building program whereby the principal routes from the China frontier were supplemented by countless parallel roads and bypasses immediately available should bombs temporarily cut stretches of the main roads. Complementing this was a well developed technology for substituting quickly assembled pontoon bridges for fixed structures when they were knocked out. 19 The almost consistent inaccuracy of the U.S. strategic bombing of North Vietnam was strikingly apparent during the major escalation of this effort in 1972. Apparently the few “smart bombs” were husbanded for attacks on important bridges and major above-ground industrial targets. Well over 95 per cent of the attacks used conventional bombs, and it was their inaccuracy that encouraged so many of the undoubtedly courageous Vietnamese truck drivers to risk barreling along the roads during the day as well as at night. Never in my travels north of Hanoi during this period was my vehicle held up because of bomb damage to the roads. But repeatedly these roads were bracketed by the huge craters of bombs that had missed—on an average of about 200 to 300 feet wide of their mark. Although road traffic was not significantly impeded by the bombing, many civilian casualties resulted (as the underground hospital wards I visited in the area testified), for in missing the roads the bombs frequently smashed the peasant hamlets that lined them. 20 These conclusions relating to Hanoi's negotiating position are based on research over the period 196773 that has involved my discussions with the Hanoi and NLF (PRG) delegations in Paris in 1968, 1969, 1970 and 1972 (October 27) as well as with members of the U.S. delegations to the Paris talks (including Ambassadors Harriman, Lodge, and Porter); with NLF and PRG officials in Phnom Penh in 1967 and in Hanoi in 1971 and 1972; with Prime Minister Pham Van Dong and his chief assistant for negotiations, Ambassador Ha Van Lau, in Hanoi in 1971 and Foreign Minister Nguyen Duy Trinh and Ha Van Lau in Hanoi at the end of September 1972. 21 Hanoi's negotiating terms during the four-year period were generally misrepresented by the Nixon Administration. I experienced a minor example of this when a confidential memorandum that I prepared for Senator Fulbright and the Department of State on Hanoi's negotiating position was leaked (presumably by someone in the Department of State) to Joseph Kraft. His column (Sept. 30, 1971) described my evaluation of Hanoi's terms as being very close to the Administration's then current public version of them, rather than the considerably different position I had actually reported. Apparently Kraft was given an emasculated or heavily doctored version of my memorandum. 22 GPO edition, Vol. II, part IV A-5, Tab 3, p. 64. 23 Corroborated by the writer during research undertaken in Cambodia in 1967. This account reflects the common denominator of opinion among three ambassadors of countries closely aligned with the U.S. as well as of members of the ICC and the UN's boundary commission. (Brief references to U.S. support of Khmer Serei activities can be found in Newsweek, 05 4, 1970, p. 24, and The New York Times, 01. 28, 1970, pp. 1, 9.) It is probable (but not provable) that the original rationale for this American policy was to weaken and overthrow Sihanouk's regime; but by 1967 the consensus of informed speculation among the diplomatic community in Phnom Penh was that the U.S. was by then simply undertaking to apply sufficient sustained pressure on Sihanouk to insure that he would not lean to the left internationally. 24 This American-supported military intervention was counterproductive, politically as well as militarily, infuriating Sihanouk and driving him to break diplomatic relations with the U.S. and to seek economic aid from Peking. 25 Based on data gathered by the writer in Phnom Penh in 1971 from American and Cambodian sources, including Son Ngoc Than, former head of the Khmer Serei. 26 GPO edition, Vol. II, part IV, A-5, Tab 3, p. 61. 27 The fullest coverage of this is to be found in Stevenson, Charles, The End of Nowhere: American Policy Towards Laos Since 1954, (Boston: Beacon Press, 1972). Substantial accounts of this covert level of American activity were available well before this section was written. See for instance Bernard Fall, B., Anatomy of a Crisis: The Laotian Crisis of 1960–61 (Garden City, N.Y.: Doubleday, 1969); Dommen, Arthur J., Conflict in Laos: The Politics of Neutralization (New York: Praeger, 1964; rev. ed., 1971); Toye, Hugh, Laos: Buffer State or Battlefield? (London: Oxford Univ. Press, 1968). 28 GPO edition, II, 9–10. 29 Gravel edition, II, 2. At the outset of the Kennedy Administration, Lansdale was assigned the position of Assistant for Special Operations to the Secretary of Defense. 30 Long afterwards Lansdale appeared to be sensitive and defensive about the speculation that he was Green's model for Pyle. 31 Gravel edition, I, 53–107 and 179–203. 32 See Fall, Bernard, The Two Vietnams (New York: Praeger, 1964), p. 246; also relevant are Henderson, William J., “South Vietnam Finds Itself,” Foreign Affairs, Vol. 35 (Jan. 1957), 287; and Buttinger, Joseph, Vietnam: A Dragon Embattled, 2 vols. (London: Pall Mall Press, 1967), II, 1101. Buttinger notes: “I myself know but cannot name American intermediaries who carried funds to Vietnamese recipients.” He also cites several other published sources. 33 Even Douglas Pike, a government employee not well known for opposition to official policy, acknowledges this. See his Vietcong: The Organization and Techniques of the National Liberation Front of South Vietnam (Cambridge, Mass. : M.I.T. Press, 1966), pp. 68–69, 83. 35 See Devillers, Philippe and Lacouture, Jean, End of a War (New York: Praeger, 1969), pp. 337, 363. 36 The Papers do disclose how adamant President Johnson was in his insistence that there be no political compromise between U.S.-backed Saigon military leaders and the NLF, or for that matter even with nonCommunist “Third Force elements.” Nothing could be more unequivocal than his cable to Ambassador Lodge of March 20, 1964: “… Your mission is precisely for the purpose of knocking down the idea of neutralization wherever it rears its ugly head and on this point I think nothing is more important than to stop neutralist talk wherever we can by whatever means we can.” The New York Times edition, p. 285; Gravel, III, 511. 37 These conclusions, by no means exclusively mine, are based on data accumulated in the course of research in Vietnam that I carried out in 1966–67, 1970, 1971 and 1972. They reflect, in addition to knowledgeable American sources, extensive interviews with Vietnamese civilian and military leaders including, among others, Generals Tran Van Don, Nguyen Khanh, Duong Van Minh, and Nguyen Chanh Thi. Ambassador Lodge's antipathetic views regarding the Buddhists are noted in the Pentagon Papers. (See, for instance, Gravel, II, 376.) Brief note is made there of the U.S. airlift of Ky's troops to DaNang for the purpose of ousting the Buddhists and their military supporters, (Gravel, II, 373), but there is no mention of the fact that U.S. troops were employed to hold the airfield so that Ky could continue to funnel in troops or that U.S. Marines held the approaches to DaNang city and refused to let rebel forces in. 39 In a letter of August 25, 1965 to the writer, William P. Bundy argued in the strongest terms against their being held. In the presidential election of 1971, Thieu maintained all of the discriminatory provisions of the 1967 election law and added others that made it impossible for even Ky to compete; he ended up with a “referendum” on the continuation of his own rule—the results of which he announced as being 94.3% in his favor. American officials did not wish Ky to run until the last minute when General Minh, the only other presidential candidate, withdrew from the race; they then insisted that a previous decision be reversed so that Ky could qualify. But at the eleventh hour, with the cards so heavily stacked against him, Ky refused to run. General Minh withdrew at a time when threats and repression against his backers were mounting and when Ambassador Bunker refused to provide assurances of American support to help insure free elections, even though Minh had provided him with a copy of Thieu's secret instructions to his province chiefs on how the election was to be controlled.